Manatees are the gentle giants of the waterways of Florida and southern Georgia, and people flock to the Sunshine State to see these amazing creatures. Manatees are sensitive to cold temperatures, and they tend to migrate in search of warmer waters during the winter, making their way to the warmer waters of Florida where the water temperature remains in the 70s for most of the year. 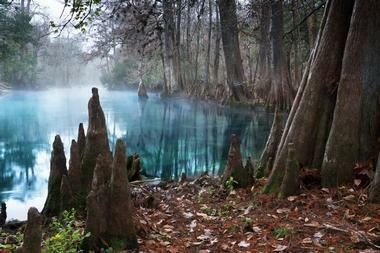 Large numbers of them come to Florida's many natural springs, and these annual gatherings are one of the coolest things one can witness. Many of the waterways and rivers are protected areas for these manatees who cluster in large groups, cuddling up in the warm spring waters. Blue Spring State Park is a state park located west of Orange City and a popular tourist destination that offers an array of outdoor recreational activities from hiking, mountain biking, kayaking, and canoeing to swimming, fishing, camping and wildlife watching and is one of the best places in Florida to see manatees in the wild. The constant 72-degree waters of the St. Johns River, which rests at the center of the park is home to more than 500 manatees, along with other wildlife such as a variety of wading birds, ospreys, eagles, and kingfishers, and plenty of fish. Blue Spring Park serves as a safe haven for these gentle creatures who come to the park to birth their calves in a protected area in the summer. 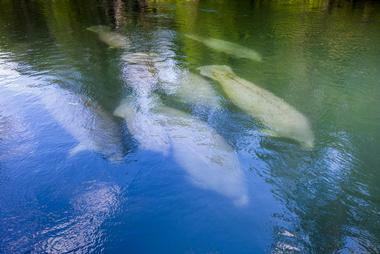 Visitors to the park can see the manatees on guided canoe, kayak, or riverboat cruises. 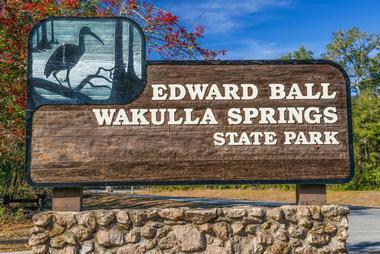 Home of the Wakulla Springs, the world’s largest and deepest freshwater springs, the Edward Ball Wakulla Springs State Park is a 6,000-acre park that hosts an array of diverse wildlife from alligators to manatees. 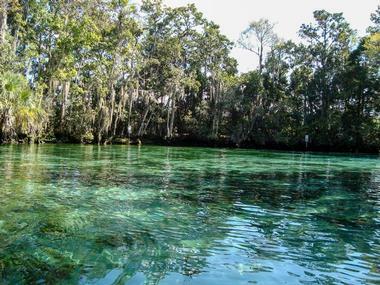 Boasting a rich history that stretches back thousands of years when early Native Americans who lived in shoreline villages, Wakulla Springs has balmy 70-degree waters that attract vast numbers of manatees which visitors can view from diving platforms or riverboat cruises. The park is also home to the historic Wakulla Springs Lodge, which was built by financier Edward Ball in 1937 and is listed on the Natural Register of Historic Places. 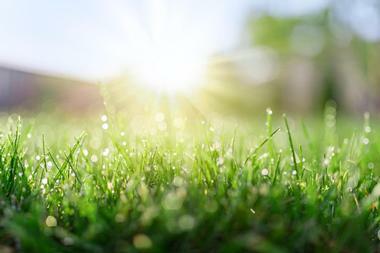 Other attractions at the park include three nature trail systems that wind their way through the beautiful natural vegetation and 54 archaeological sites throughout the park. The Lee County Manatee Park is a 17-acre regional waterfront park in Fort Myers that provides an excellent opportunity to see manatees up close. Established in 1996, the park is situated right across from the Florida Power and Light Power Station which releases clean, warm water into the brackish Orange River, attracting large numbers of manatees who are very particular about the water they swim in. The family-friendly park boasts several great viewing points to see the manatees, including underwater viewing points where visitors can hear the manatees communicating with each other. There are several hiking and nature trails, a boardwalk that winds through the mangroves, plenty of picnicking areas, kayak rentals, and an amphitheater. Manatee Springs State Park is a public park that features an array of amenities and facilities, including an 800-foot boardwalk that winds its way through a forest of tall cypress trees overlooking one of Florida’s first magnitude springs. 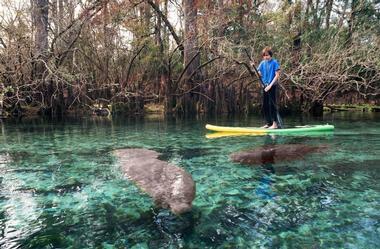 The temperate waters of the springs attract manatees in the colder months, which can be viewed from the boardwalk or on kayaking or canoeing tours. The park also offers over eight miles of nature trails with a connection to the 32-mile Nature Coast State Trail, along with camping, fishing, canoeing and kayaking, picnicking, scuba diving and cavern diving, snorkeling, swimming, and wildlife viewing. Visitors can also enjoy pontoon boat tours, guided nature walks, and ranger-managed campfire circles at the outdoor amphitheater on the waterfront. 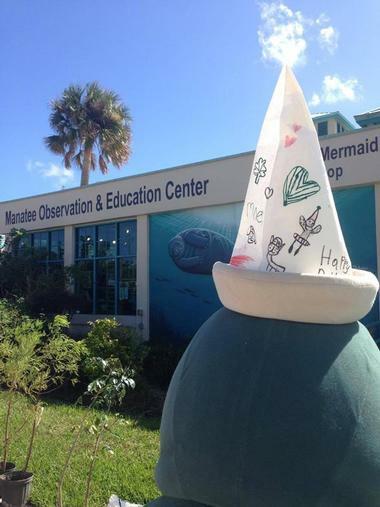 The Manatee Observation and Education Center is an environmental education and wildlife viewing center in downtown Fort Pierce, which is dedicated to coastal awareness. 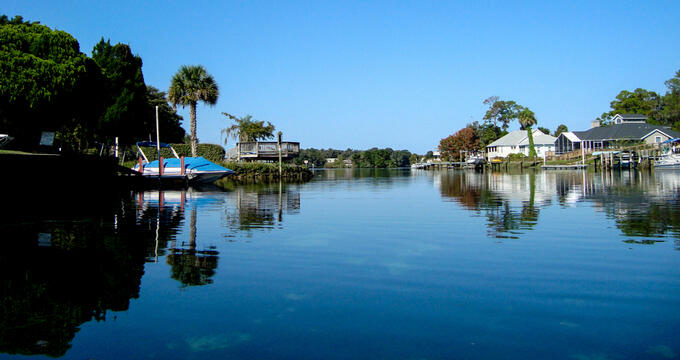 The Center straddles the saltwater Indian River Lagoon and freshwater Moore's Creek, a freshwater tributary and historically renowned for being a gathering place for Florida manatees who come together in the warm runoff water from the disused Henry B. King Power Plant. The Center aims to inspire an interest in these gentle giants, as well as the coastal environment in which they live and the conservation of Florida's diverse habitats. The Manatee Sanctuary Park is a 10-acre waterfront park situated on the Banana River in Cape Canaveral that offers something for everyone. This riverside park serves as a protected manatee habitat, and visitors often see these beautiful creatures feeding off the sea grass along the boardwalk. The park has an array of amenities and facilities for families to enjoy, ranging from a half-mile paved fitness trail, exercise stations, a shaded boardwalk along the river, picnic tables and barbecue grills, a covered pavilion with a basic kitchen for events and functions, an electric vehicle charging station, a Zagster Bike Share Station, and a playground. Manatee Sightseeing Eco Adventures is a family-owned and operated tour company that offers manatee sightseeing tours in Naples, Florida. Established by Captain Barry and Carol in 1999, the company has added six boats in the fleet and takes visitors on 90-minute manatee tours to see and experience manatees in their natural habitat. Tours explore the Faka Union Canal, which is part of Port of the Islands and the 10,000 Islands and there is plenty of other wildlife to see, ranging from alligators, sea turtles, and dolphins to egrets, wading birds and more. All captains are licensed, insured, and certified with CPR/First Aid and share their knowledge, passion, and humor with guests along the way. Merritt Island National Wildlife Refuge is a vast 140,000-acre U.S. National Wildlife Refuge on Merritt Island, Florida's largest barrier island. 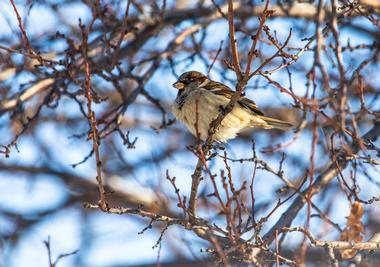 The refuge shares the island with NASA's Kennedy Space Center and visitor complex, and due to restricted access, the sanctuary enjoys a relatively undisturbed wildlife habitat. 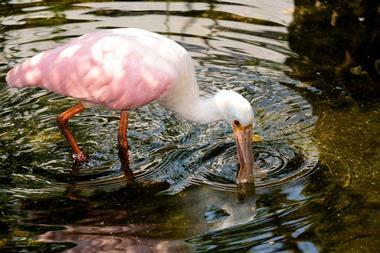 The NWR is home to a diverse variety of fauna and flora, including fish, amphibians and reptiles, birds, mammals, 21 of which are listed as endangered by the state of Florida. A 'gateway site' for the Great Florida Birding Trail, the NWR also boasts excellent hiking and driving trails and is an excellent spot for sighting West Indian manatees. The TECO Manatee Viewing Center is a protected marine reserve next to TECO's Big Bend Power Station in Apollo Beach that attracts thousands of visitors each year to see manatees that are drawn to the plant's warm-water discharge canal. 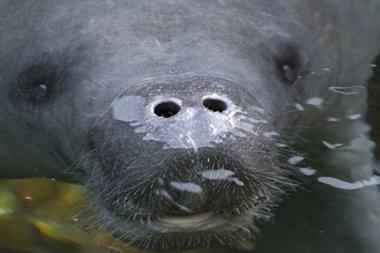 Established to educate the public about the Florida manatee and its habitat, the state, and federally designated manatee sanctuary also boasts an array of interactive exhibits and displays about the manatee and showcases life cycle of the manatee and the challenges it faces as their habitat becomes smaller and smaller. Other main draws at the 50-acre attraction include a butterfly garden, a lovely tidal boardwalk with a 50-foot observation tower, and an education center. The Crystal River National Wildlife Refuge Crystal is located on the shores of Kings Bay in the coastal city of Crystal River and is home to manatees year-round. Established in 1983 to protect the West Indian Manatee, the 80-acre refuge is the only sanctuary created solely for the protection of the threatened Florida Manatee and is part of the United States National Wildlife Refuge System made up of 20 islands and several small parcels of land. The refuge preserves the spring habitat in Kings Bay, and provides an important safe and natural habitat for the large manatee populations that migrate here every winter.